Ambassador Martine Schommer took up her duties as Permanent Representative of Luxembourg to the OECD on 6 September 2017. Ms. Schommer was born on 13 July 1961 in Luxembourg. She holds a degree in Russian and Chinese language and civilisation from the Institut des langues et civilisations orientales (INALCO) at Université Paris III-Sorbonne nouvelle. Having entered the Ministry of Foreign and European Affairs of Luxembourg in 1987, Ms. Schommer was Secretary of legation at the Permanent Representation of Luxembourg to the European Union from 1991 to 1995. After serving as diplomatic advisor to the Prime Minister of Luxembourg from 1995 to 1998, Ms. Schommer was appointed Ambassador to the People's Republic of China with co-accreditation to Mongolia, Singapore and Viet Nam for four years. In 2002 she was appointed Director of Political Affairs at the Ministry of Foreign and European Affairs. Ms. Schommer then served as Permanent Representative of Luxembourg to the European Union from 2004 to 2008 in Brussels and as Ambassador to the Federal Republic of Germany from 2008 to 2012. 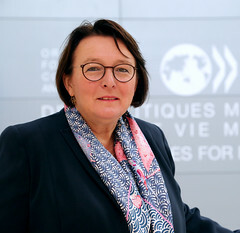 Prior to her appointment as Permanent Representative of Luxembourg to the OECD, Ms. Schommer served as Director of Development Cooperation at the Ministry of Foreign and European Affairs as well as non-resident Ambassador to the Republics of Mali, Burkina Faso, Niger and Senegal from 2012 on. Ambassador Schommer is married to Mr. Jean-Jacques Welfring.